More than a million Iraqis have fled for their lives in the wake of ISIS terrorist activity since June 2014. As bullets flew, many left their homes and businesses with only the clothes on their backs. 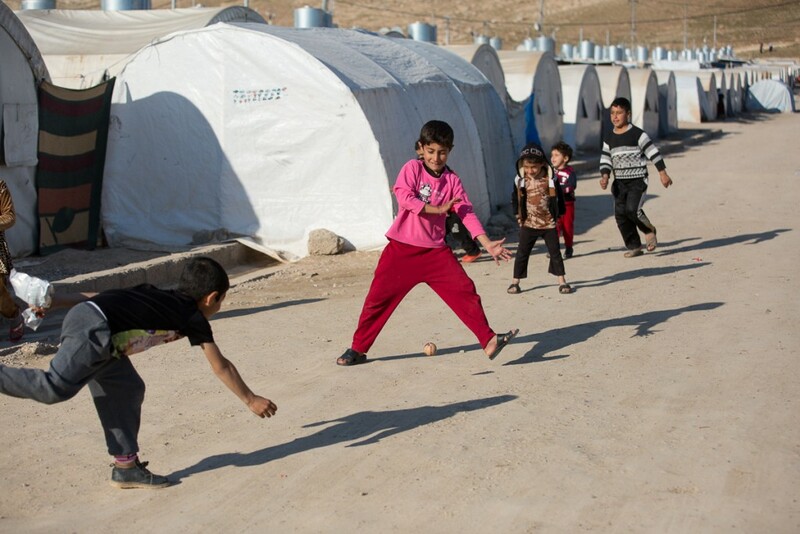 Escaping to the Kurdish areas of Northern Iraq, they are now living in and around camps with hundreds of thousands of other internally displaced people (IDPs). In the beginning, some could afford to rent temporary housing, but now almost two years into the crisis,many are left to rely on the camps for shelter. Of course, no one knows when they might be able to return home.  Samaritan’s Purse has been there from the beginning of the crisis and continues to provide relief supplies and programming, even though some other organisations are winding down their activities. Wisam stands with his car “The Red Rocket,” which he used to escape with 13 other people from Qaraqosh when ISIS invaded the city. 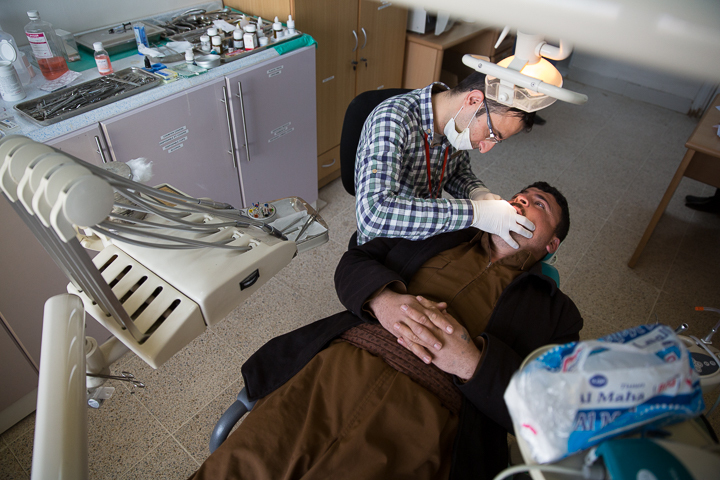 Our work is meeting both physical and spiritual needs for people like Wisam, 36. 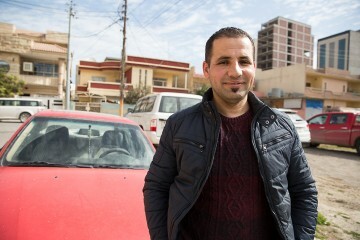 Wisam found work with Samaritan’s Purse as a translator in November 2014. Just three months earlier, he had fled the ISIS takeover of his hometown, Qaraqosh, a traditionally Christian city of 100,000. He escaped in his tiny, red, 1994 Opel packed with 14 people. Serving alongside Samaritan’s Purse staff, Wisam soon discovered a difference between his version of Christianity—visiting church once or twice a year—and the personal relationship his coworkers have with Christ. He was delighted to learn that he could talk to God in prayer—just one aspect of the Good News he previously did not understand. A shipment of 100,000 shoes will soon be distributed. 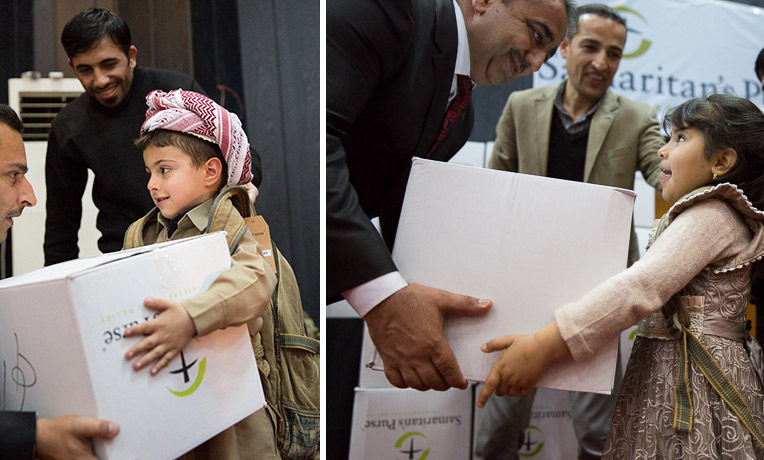 Each pair is a welcome gift—especially for those who wore through their only pair of shoes as they fled on foot from ISIS. Peshmerga soldiers, Kurdish military forces, are fighting on the frontline against ISIS. Some of the children of the fallen received winter clothes and Operation Christmas Child shoeboxes from Samaritan’s Purse. In various locations around Northern Iraq, Samaritan’s Purse is improving water, sanitation, and hygiene (WASH) for IDPs. At one camp where we regularly maintain the WASH infrastructure, we have replaced more than 12 miles of piping with quality materials in order to keep latrines and showers functioning properly. We also distribute hygiene kits complete with soap, shampoo, a toothbrush, toothpaste, and feminine products as well as special kits designed specifically for infants. When scabies spread in one camp, Samaritan’s Purse obtained the appropriate treatment and contained the outbreak. Samaritan’s Purse promotes sanitation in the camps as well by clearing trash. As we began this work in one camp, IDPs requested bags to help in the process. In one area where garbage had collected in the past, we built a soccer field to give the displaced a reason to keep it clean. Of Mahmod’s 37 extended family members, 23 of them—including his wife and six of his seven children—are still being held by ISIS. Mahmod bought one of them back for $35,000, but he didn’t have enough money to purchase any others. He tells of his 12-year-old daughter who was given against her will to an ISIS fighter. Desperate, Mahmod intends to send the women and girls of his extended family to Germany this summer to seek a new life. 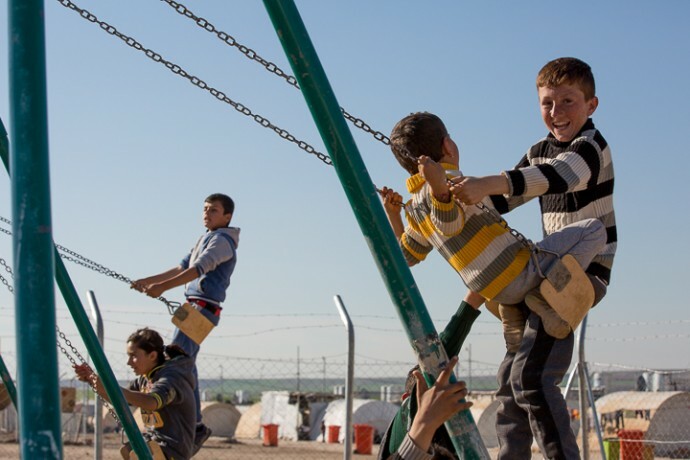 Family is central to Iraqi culture and Samaritan’s Purse recognises that in our programming. We invest especially in vulnerable women and children and also train the fathers and brothers in an effort to bless the home as a whole. At a community centre that opened near one IDP camp in October 2015, we offer a variety of skills classes for men, women, and children. The husband and children of one of our sewing students are still held by ISIS. The other ladies are giving her the clothes they make in class because she has so little. At the end of the four-week class, Samaritan’s Purse gives each student a sewing machine so they can use their new skill to provide for their family or to set up a business. While carpentry and sewing are being taught to the adults, children and youth can take photography or art classes, or participate in programming at the child-friendly space on site. Literacy classes will also be offered soon. At another location, a community-based protection programme is in the process of organising activities for the whole family as well. From outreach to the handicapped of all ages—who make up 21 percent of the population—to sports, art therapy, and a library, plans contain something for every age group in the camp. Samaritan’s Purse has a medical clinic in one location, with another scheduled to open this month in another part of the country. We offer general medicine, obstetrics/gynecology (including sonography), and dentistry. Since other medical care in the area is very costly, we are pleased to serve the needs of IDPs free of charge. But these various services are not all they ways we are at work. As speculations rise about the retaking of Mosul from ISIS, Samaritan’s Purse is preparing contingency plans for the fallout. 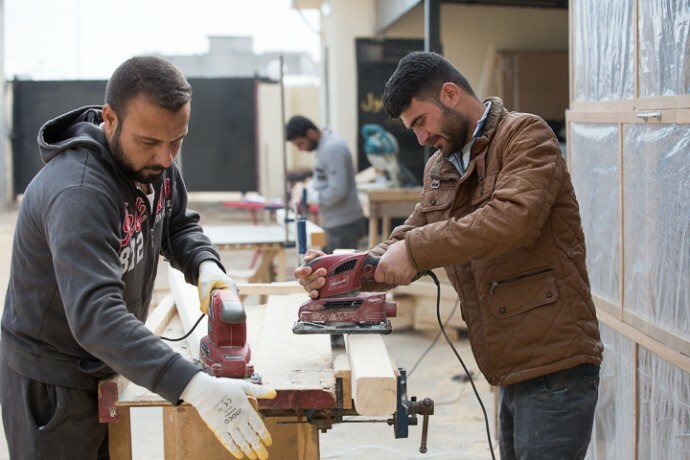 “The United Nations estimates there could be as many as 500,000 Iraqis displaced from the city of Mosul,” said Matthew, the Samaritan’s Purse country director for Northern Iraq. 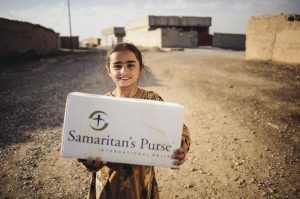 Samaritan’s Purse intends to be there to help in Jesus’ Name. Please continue to pray for the people of Iraq and our staff as they minister to them.